This Place of Worship was founded before 1357, but we understand it was closed in 1984. Available parish registers cover the periods 1558-1982 (baptisms), 1558-1983 (marriages) and 1558-1872 (burials), so evidently it had a graveyard. The Bristol Town Plan of 1884-1885 shows no graveyard adjacent to the church, but two (disused) graveyards in the area are marked. One was on the corner of the junction of John Street and Tower Lane (opposite St John's Almshouses), and the other in a block bounded by All Saints Street, Pithay, Duck Lane (now Fairfax Street), and Nelson Street. The former belonged to St John's - details of St John on the Wall Burial Ground may be found elsewhere in this database. Because of St John's unusual position, set into the City Walls, as it were, it was also known as St John on the Wall". Another medieval Church, dedicated to St Lawrence, once stood on the other side of the gateway (St Lawrence on the Wall), but it was demolished before the days of extant parish registers. 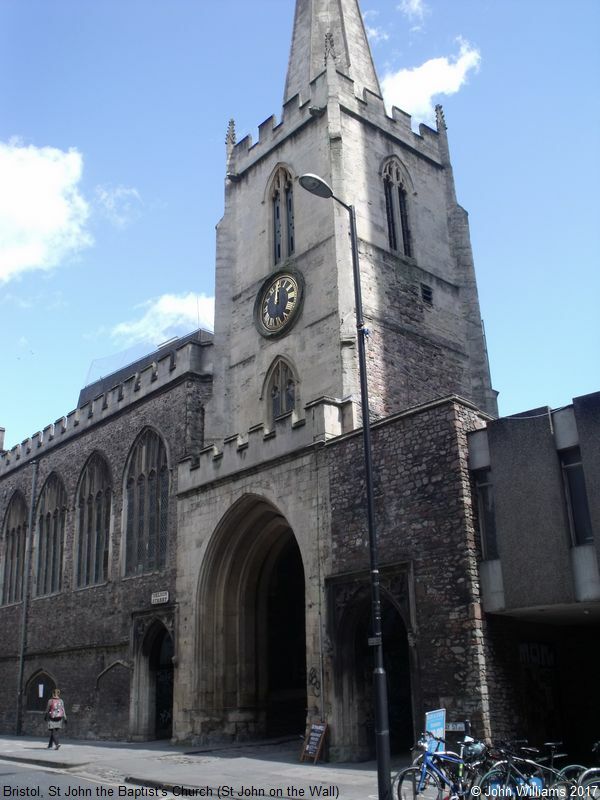 St John's is believed to have closed in 1984, and is now in the care of the Churches Conservation Trust, and a Museum. 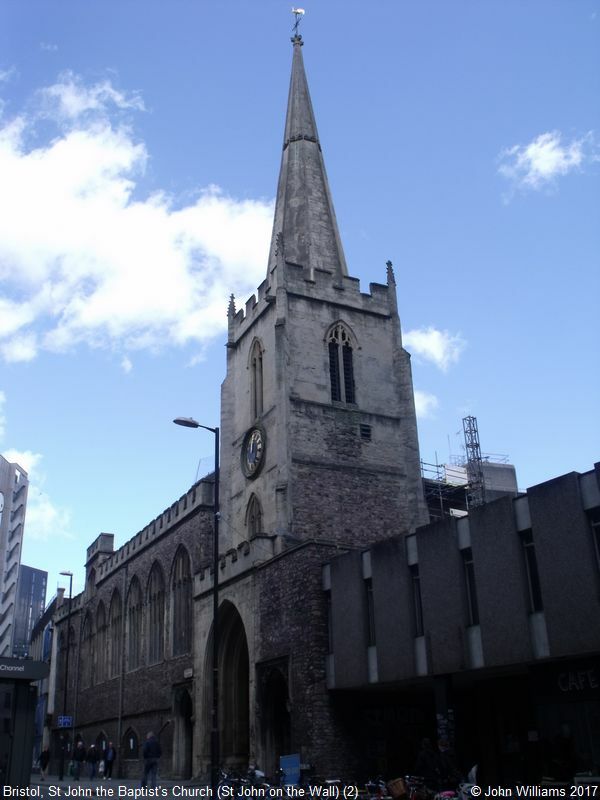 St John the Baptist's Church ("St John on the Wall"), Bristol shown on a Google Map. I have found many websites of use whilst compiling the information for this database. Here are some which deserve mention as being of special interest for Bristol, and perhaps to Local History and Places of Worship as a whole. See St John on the Wall Burial Ground elsewhere in this database. See St Lawrence on the Wall elsewhere in this database. Information last updated on 8 Nov 2018 at 09:57. This Report was created 28 Mar 2019 - 10:55:39 GMT from information held in the Gloucestershire section of the Places of Worship Database. This was last updated on 7 Feb 2019 at 07:45.